Traeger Renegade Elite Review (April 2019) - Worth the Price? If you haven’t heard of Traeger before they are a company that specializes in grills/BBQ’s and everything that is closely related to that. So, when it comes to this area of grills they really are a company that has a lot of experience and knowledge because that is their primary focus. 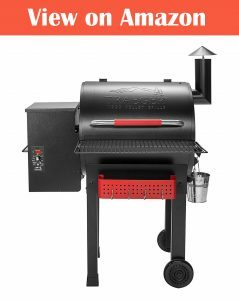 Now when it comes to this Traeger Renegade Elite it comes with quite a hefty price tag but does the quality of the grill deserve the price that they are asking for. Below I will break down all the different elements of the grill and what I think about each of them after 3 months of using it myself. The first thing that I want to talk about is the set up of the grill. I personally found the set up to be quite easy. I just followed the instructions that where simple and well laid out. It only took me just over 1 hour to get it out of the box and up and ready to start grilling. After having tested and used a lot of different grills on the market I can say this is one of the easier ones to set up. Once everything is set up you will see how the grill looks. Personally, I love the black and red color scheme and the metal that it’s made from feels strong and hefty. The metal is also coated with something which will protect it from the elements. After my 2 months of usage I didn’t notice any signs of wear – it still looks like new which is a great sign. The 2nd thing I want to talk about is that this grill is powered by wood pellets. Unlike most other traditional grills which use propane or gas. I have tested a couple of other grills that are designed to be used with wood pellets but none of them worked quite as well as this grill. The reason being, with other wood pellet grills you constantly have to feed more wood onto the grill as you are cooking, it is often impractical and quite a nuisance in cases. Though with this Traeger Renegade Elite grill you don’t have that issue. How it works is you put some the wood pellets into the box as you can see in the picture on the left. This box automatically feds more wood pellets into the grill as they are needed. You adjust it manually to the temperature you like using the digital dial. I bought this grill from Amazon and it came with 2 packets of wood pellets included. There is a heat sink right where they heat is distributed in the grill. This really helps disperse the heat and everything is cooked evenly throughout – there are no hot or cold spots. Though how does the food taste? Well that’s one of the main benefits of this grill is it makes the foods have such a unique and amazing flavor that you simply can’t get with regular kinds of grills. I particularly love it for cooking meats it leaves them smelling wonderful and keeps them succulent. Though keep in mind you can literally cook anything with this grill once the hood is down. I have cooked vegies, pizza and even bread. All of which cooked perfectly. Basically, it’s like an oven but with the unique taste that the wood pellets give it. Traeger actually have a host of different kinds of wood pellets including hickory and Applewood. In terms of cooking space there is plenty at 380 square inches. You cook easily fit one large pizza or 6-8 large steaks. So even if you have a big family you should be able to fit plenty of food onto the grill. In terms of cleaning the grill grates – they are made from porcelain and are coated with non-stick. You can simply take them out and wipe them down with a cloth and some soap and all the grim comes off easily. Also, all the grease will empty into the bucket as you can see on the picture, so that is extremely easy and convenient to empty and wash out. As for the overall footprint of the grill, it is quite large measuring in at 40 inches wide, 50 inches tall and 22 inches deep and weighing in at 100 lbs. So, if you are looking a grill that can fit in a tight place this likely isn’t your best bet. As for moving the grill around. You can move quite easily using the built-in wheels which is handy to addition to have. A couple of final things I would like to mention about this grill. One is that there is an extra area in front to place your food to rest or whatever you like which is handy. Also, there are a few hooks where you can hang your utensils and a place to keep sauces and salt/ pepper etc. 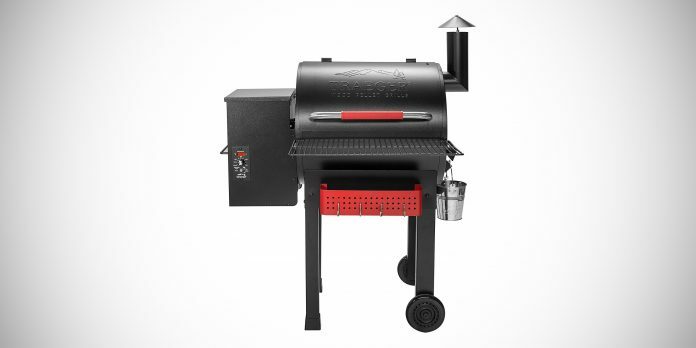 Also, there is a auto start ignition so there is no need for fire starters or anything of the like which is a nice convenience to have especially when you haven’t used it before on a grill. In conclusion the Traeger Renegade Elite grill offers everything you would want from a grill basically offering you the functionality of an oven for outside and with the amazing taste that cooking with wood pellets gives. As for the Traeger Renegade Elite price, well its quite expensive but you are getting what you pay for in this case and I can easily recommend it myself. Weber S210 Review - The Best Grill I Ever Used?